The historic kitchens in The Grange were a dynamic part of the Iris Haussler installation “He Named Her Amber“. Here visitors experienced the mysterious world of a fictitious maid who hid waxen globules under floor bricks and in the walls. Once the installation was over, I needed to re-imagine another world, one that still involved The Grange servants, but in a different way. With the house no longer restored as an historic house museum, I also had to find a way to make the period kitchens relevant to our visitor. Three themes became immediately apparent—the lives of the servants; the work that they did; and, how kitchen technology changes over time. With these themes in mind, I began to imagine how to illustrate them with the artifacts that I had. One of the important bits of work was obviously cooking and I had lots of artifacts to illustrate that. I was able to set up several other work related “stations” including cleaning, the work involved in lighting a house and laundry. Obviously there was more work done than just these, but I had the artifacts to demonstrate these activities. The previous historic kitchen did not effectively show the presence of servants in the basement, so I turned one room into a servant’s hall, setting a table as if for a meal and putting in a day bed for them to sit on. Changing technology was also straight forward as we could contrast the open hearth cooking of the early part of the 19th century to the cook stove technology of the mid-century. The servant’s bells and the rising cupboard are other examples. Changing technology, in our case, refers to the first half of the 19th century due to our collection. In the future, it might be possible to show further changes through archival material. Two things have not changed, however, just as The Grange cooks used seasonal and local ingredients, so to does Anne Yaramovitch and her team of chefs in the AGO kitchens. And, just as The Grange was a social centre of the city (parties held here were written up in the newspapers) so to is it a place for members to gather for food and conversation. Blackwood talks about key aspects of his prints – his ancestors who were sea captains. The SS Imogene has close personal associations for Blackwood – it was captained by his grandfather. Each spring the ship left St. John’s for the Labrador icefields. The sealers on board hoped to earn much-needed cash, yet dreaded the potential dangers ahead – bitter cold, fog, powerful waves, crushing ice and gale-force winds. Departures were particularly poignant, as many sealers never returned. In 1933 the SS Imogene brought in a record number of seals. Twelve years later the ship hit a sandbank and sank. Its bell and flag were rescued and are on display in this exhibition. The Sruti Laya Fine Arts Academy are performing in the Maharaja exhibition beginning this Saturday, February 19, and then again on February 20, February 26, February 27, and March 15, March 16.
inDANCE will be returning Monday February 21 to perform for Family Day. See our full performance schedule for details. In partnership with The Canadian Academy of Recording Arts and Sciences (CARAS), we’ve launched The JUNO Tour of Canadian Art, bringing together great Canadian art and great Canadian music. Eight JUNO Award-winning musicians: Alpha Yaya Diallo, Buck 65, Dan Hill, Gord Downie, Hawksley Workman, Jane Bunnett, Measha Brueggergosman and Tanya Tagaq selected an artwork from the AGO’s collection and shared with us both a personal response and song that connected them to the work. Their recorded responses can be found, and heard, next to the art. In the Canadian collection and in the Henry Moore gallery until August 31. No subject has inspired Blackwood more than the isolated outport of Wesleyville on Bonavista Bay, where he was born and raised. While he now makes his home in Ontario, Blackwood returns to northeastern Newfoundland every year to work in his Wesleyville studio. Through his prints he keeps alive the memory of his hardy ancestors, the places where they lived and worked, and a way of life that all but disappeared after Confederation (1949) and resettlement. For more than a century, the settlers of this town (immigrants from the West of England) battled the Atlantic Ocean, struggling to make a living in the seal hunt and cod fishery. The violent storms, looming icebergs, bone-chilling cold and isolation that they encountered permeate Blackwood’s imagery. “The Newfoundland that we knew is no longer there,” Blackwood once said. This comment is particularly relevant to the fishing outport of Bragg’s Island, where as a child he spent most of his summers with his maternal grandparents. He remembers Bragg’s Island fondly – the sense of community and the inhabitants’ self-reliance, confidence and industry. In the early 1950s, however, his world was shattered by the provincial government’s resettlement policies. The entire town was forcibly uprooted to join a community on the mainland, in part to provide them with better social services. In his prints Blackwood draws on memories, letters, photographs and even personal belongings to express this loss and to reclaim the Newfoundland of his youth. The AGO is the central public collection for the study and enjoyment of Paterson Ewen’s artworks. Matthew Teitelbaum, Director & CEO of the Art Gallery of Ontario, explains how this came to be. David Blackwood’s prints are a metaphor for the triumph of the human spirit over adversity. Set before our time, his images depict Newfoundland as a place of struggle, danger and tragedy. They tell stories of a barren land, a hostile climate and a threatening sea. Drawing on childhood memories, dreams, legends and oral histories, Blackwood captures the hardships of the cod fishery and the seal hunt in the land of his ancestors. Life is fragile, and death by drowning or exposure ever-present. Yet the earnest, hard-working, God-fearing people of Bonavista Bay persevere in a menacing world. Blackwood talks about a key aspect of his prints – the role of storytelling. 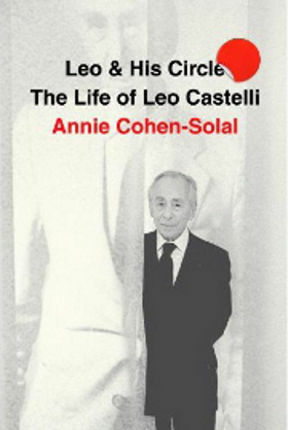 Annie Cohen-Solal speaks about her new, best-selling biography of renowned gallery owner Leo Castelli. Annie Cohen-Solal was born in Algeria. She is currently Professeur des Universités at the CNRS (Centre National de la Recherche Scientifique)-Paris and Research Fellow at Tisch School of the Arts, New York University. She first came to New York in 1989 as the Cultural Counselor to the French Embassy in the United States, after her Sartre biography, Sartre: A Life, had become an international best seller. Her encounter with Leo Castelli prompted her to shift her interest to the art world. After winning the Prix Bernier of the Académie des Beaux-Arts for Painting American (Alfred A. Knopf) in 2001, she was awarded the ArtCurial Prize for the best contemporary art book for Leo Castelli & les siens; (Gallimard, Paris). The American version Leo & His Circle was published by Alfred A. Knopf in May 2010. The Italian version Leo & Cie: Life of Leo Castelli will appear in November 2010 (Johan & Levi, Milano). In 2009 she was awarded the Legion of Honor of the French. She lives in New York, Paris and Cortona. Presented in partnership with the Canadian Art Foundation and the Consulate General of France in Toronto.